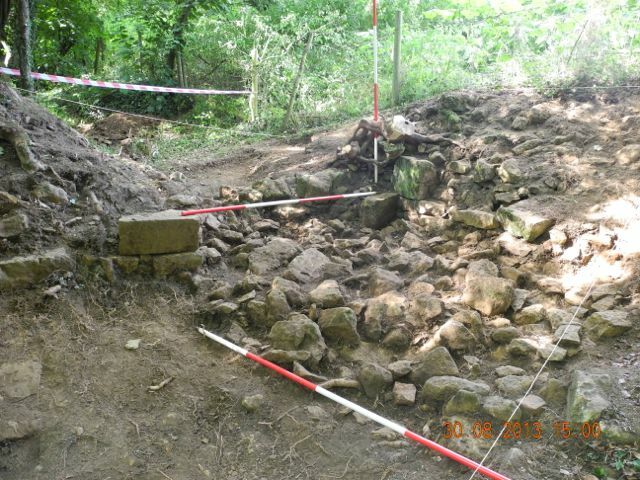 AUGUST 2013 - TOO MUCH ARCHAEOLOGY? Our first outing of the month was to Enstone to peer into someone's cellar - and very interesting it was. 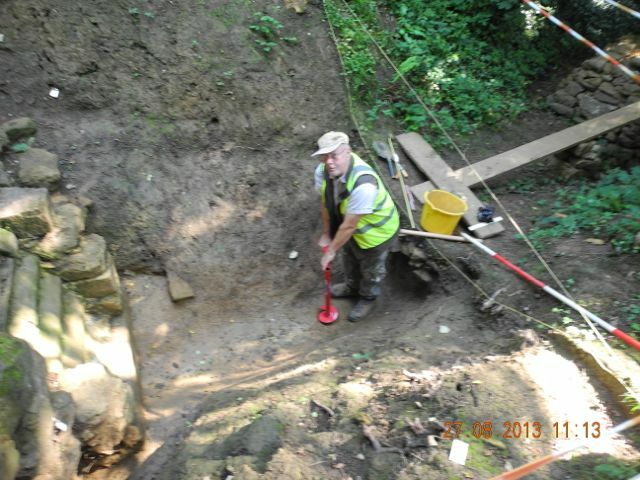 The first official digging day at Hanwell was sort of rained off but on Tuesday August 6th. we appeared mob handed with six diggers in action. We were able to do a little tidying up on the terrace above the sluice, start work on clarifying the arrangements of steps that Rowena, Christopher and friends cleared last month in the sunken garden and most significantly of all return to the island in force with a day of extreme weeding, as you can see below. 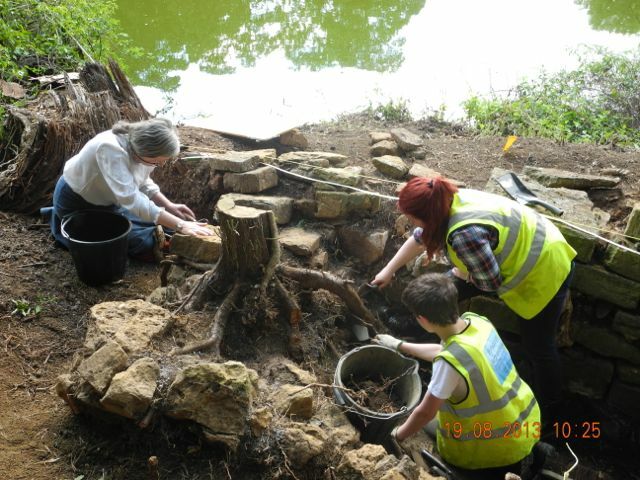 Work continued to remove the deep cushion of 'topsoil', a dry friable deposit composed largely of decayed pine leaves and cones with a smattering of fish scales, presumably left by the resident heron population. 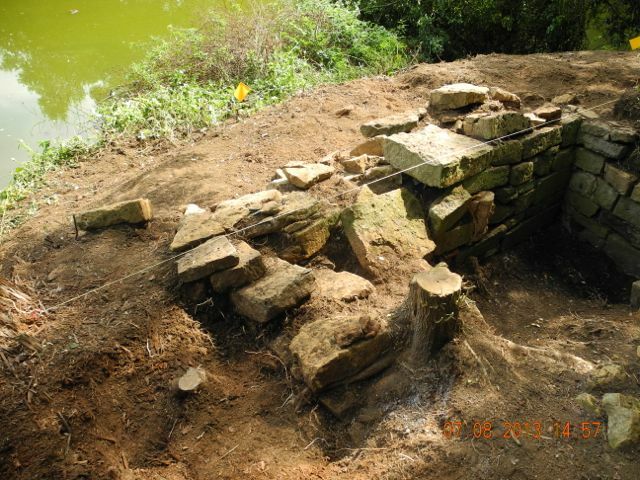 The outer face of wall round Sir Anthony's Bath is starting to be uncovered prompting the question of how the thing was built. So far the outer faces appear to be roughly coursed rubble, quite unlike the ashlar blocks employed to face the interior. 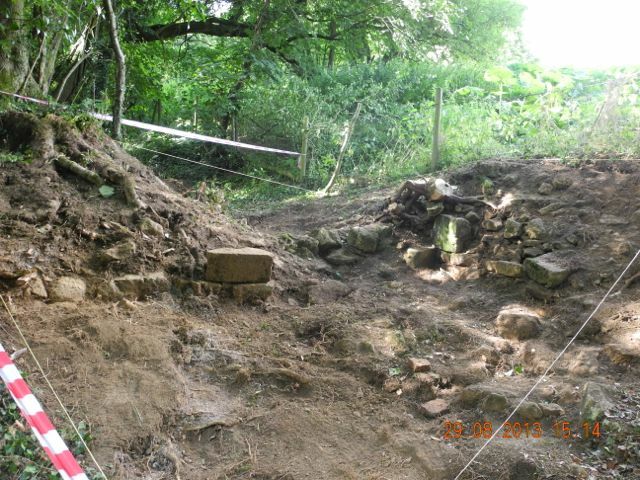 Whilst the rougher rubble does not seem to have been designed as a visible feature we can see so evidence for a cut into which it was set, the topsoil is just piled up against it. 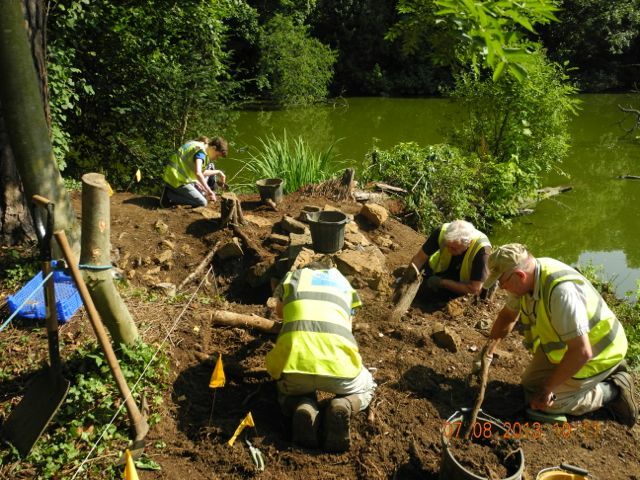 Apart from a couple of loose floor tiles we have yet to discover any evidence for paved surface which we have assumed covered the surface of the island, in fact no structures at all as yet save for the bath itself and a few architectural fragments. Has more been lost than we assumed... well, we'll see. Team work, hoards of diggers stage an attack on the roots. 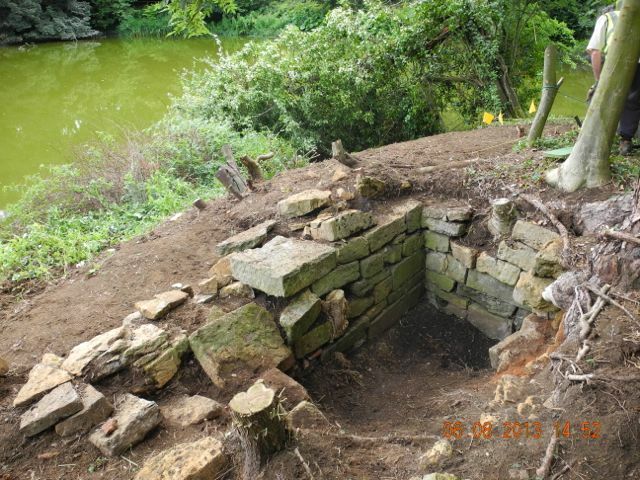 The outer face of the north wall of the bath is starting to appear. How archaeology ought to be done, trowelers all neatly arranged in a line.... alright, so perhaps that's not always the best way to proceed. 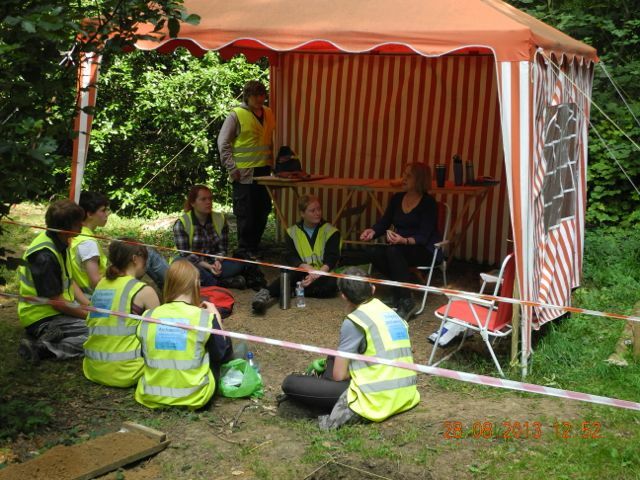 On the Monday after Fairport's Cropredy Convention we were joined by an influx of volunteers new to Hanwell, some had helped at Farnborough and some were having their first experience of archaeology. We hope to welcome them all back at some point in the future. This all meant that we were able to have two teams in action: one on the sluice and one on the island, then they changed round after lunch to expand their experience. 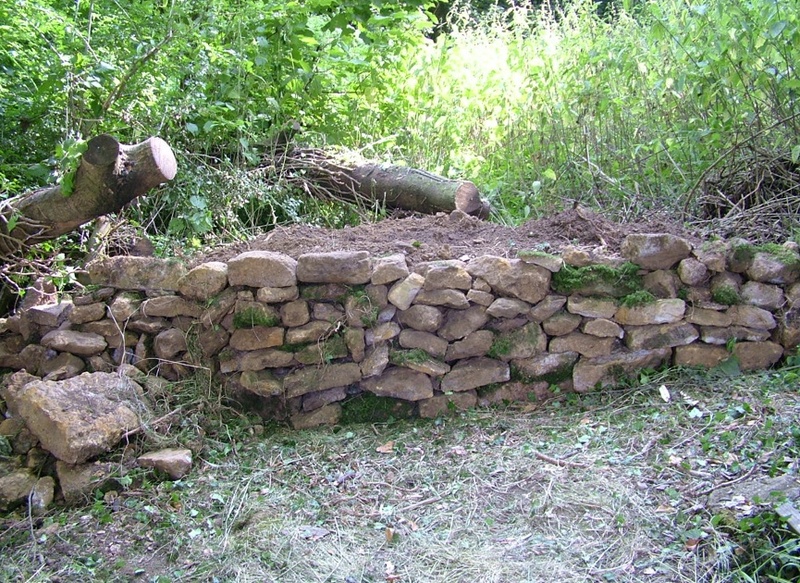 We made really good progress and got up some momentum which carried on during the week with Ray and Tony doing sterling work reducing the levels of topsoil around Sir Anthony's Bath and progress being made on the lower levels of the channel downstream from the walling where some interesting stones started to emerge. 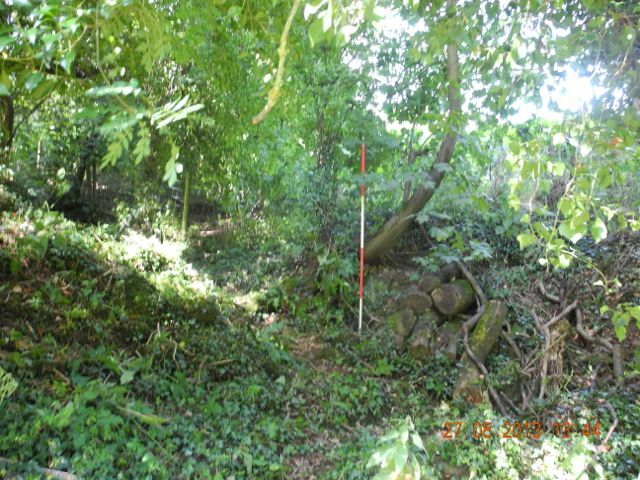 A team from John Moore Heritage Services have started work on the adjacent property in advance of some building work, the heavy machinery ground on for the best part of Monday and Tuesday, oh, the happy memories that brings back. The following week got off to an exciting start. 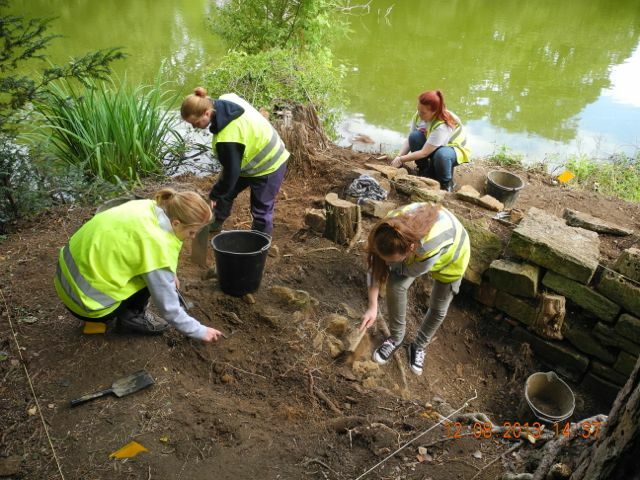 We had already shipped three people over to the island to start digging when Rowena popped over to take a look. Unfortunately one of her guests who was next across was on board when the boat snagged a sunken branch which manged to tear a hole in both the outer and inner buoyancy chambers and the whole thing exhaled explosively and sank in a froth of bubbles and black mud. Fortunately the hapless passenger was close enough to the landing stage to haul herself back to land. This left four of us marooned on the island with nothing to sustain me except for coffee sent across in a bucket (thanks Peter). 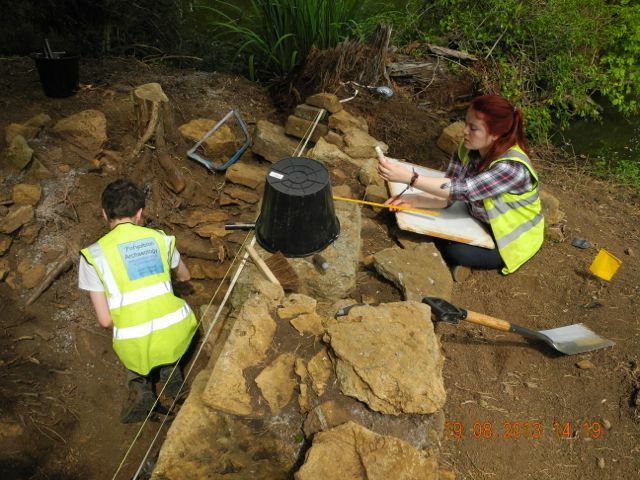 Rowena decided to put the time to good use by helping excavate some particularly fragile stone work whilst Christopher and those onshore plotted our rescue. 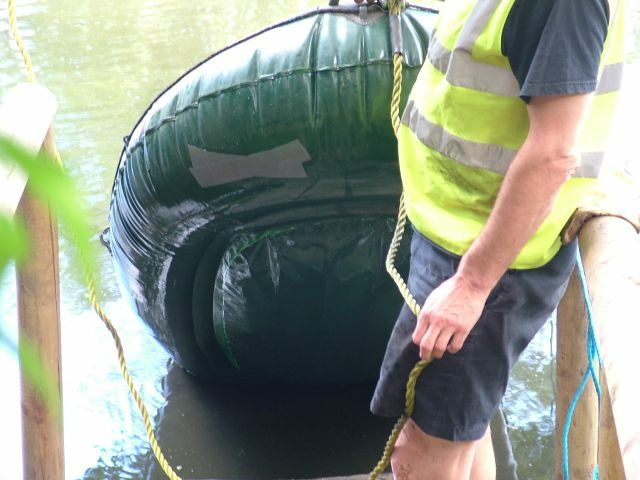 After considering a number of alternatives it was gaffer tape that saved the day enabling us to re inflate the boat sufficiently to get everyone off the island... phew. Amazingly, having ordered a new boat on line at tea time that day it was delivered by breakfast time the next day so work continued unabated. The rest of the week was something of an anticlimax. More was done to define the limit of Sir Anthony's Bath and the suspicion formed, following a lot of paddling round the periphery of the island and feeling stone underfoot in places a good 2 metres out from the current perimeter, that we may have lost a considerable amount of it to erosion since the seventeenth century. 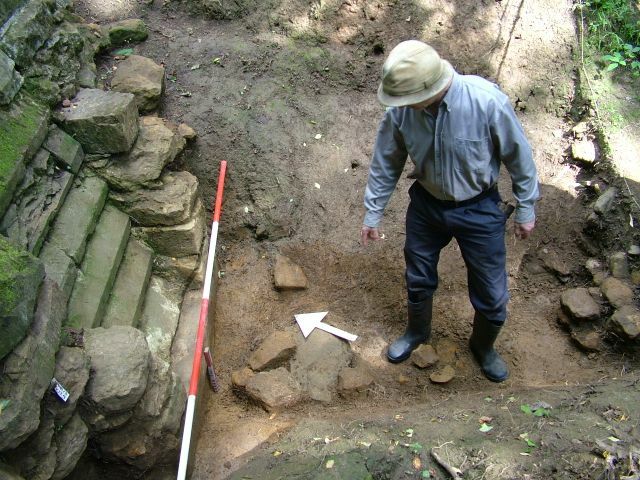 On the sluice cascade what must surely be the lowest level of silting was cleared and the full size of the lintel which underpins the whole structure emerged. Up stream pairs of diggers struggled valiantly to reduce the large dump of clay which seems to have been piled up against the face of the wall. After taking out another 30 centimetres or so of hard packed clay on the terrace to the north we have reluctantly come to the conclusion that we have no indication of a related structure up there. We are an equal opportunities employer, everyone gets to draw stones. The final deposit of rubble and silting... or is it? 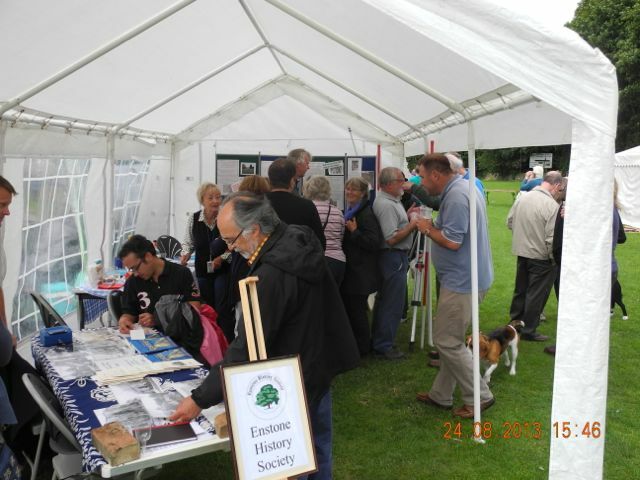 On the Saturday of the bank holiday weekend I took myself off to Enstone Show to share a marquee - and cake and wine - with the Enstone Historical Society. 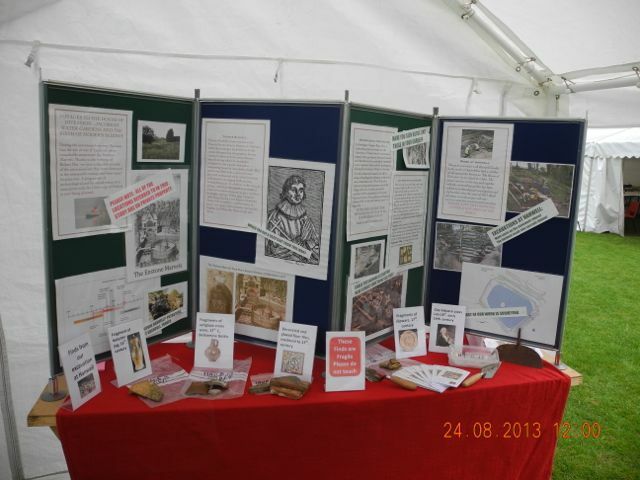 I put up a display to explain our intentions to explore the locality and gave out over 50 A4 threefold illustrated leaflets inviting members of the community to join in. Interested parties dropping by included engineers, surveyors, conservation architects and a brace of archaeologists, clever people in Enstone. 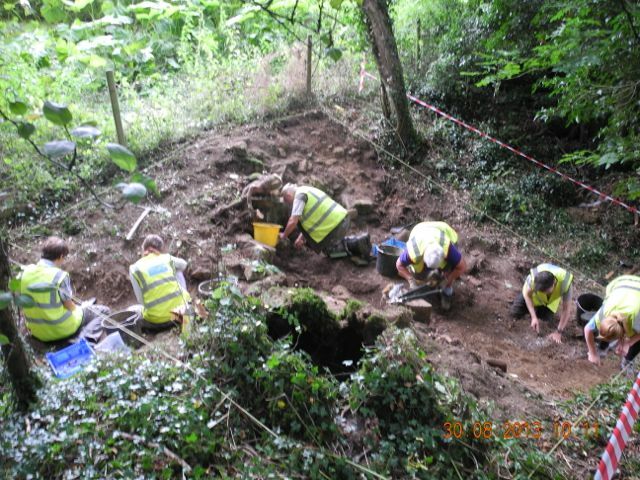 I was also able to drop round, by invitation, to see the final stages of the work to excavate next to castle in advance of the building work that is planned. There was a large area open with heavy stone foundations outlining the eastern range of the castle together with some other walling doing very unexpected things. I'm sure the published report will prove fascinating. Before... Peter swings his axe.... after. 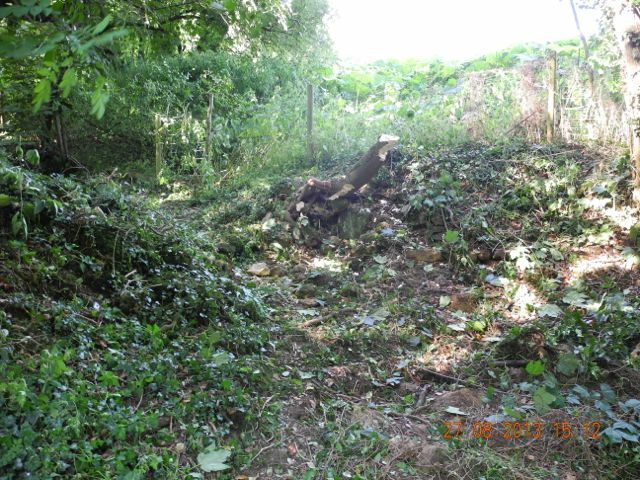 Once the ground was clear the 'extreme weeding' squad could move in and after a day of shifting undergrowth and starting to clear rubble, structures were starting to appear. Meanwhile work at the top sluice/cascade is drawing towards an end. 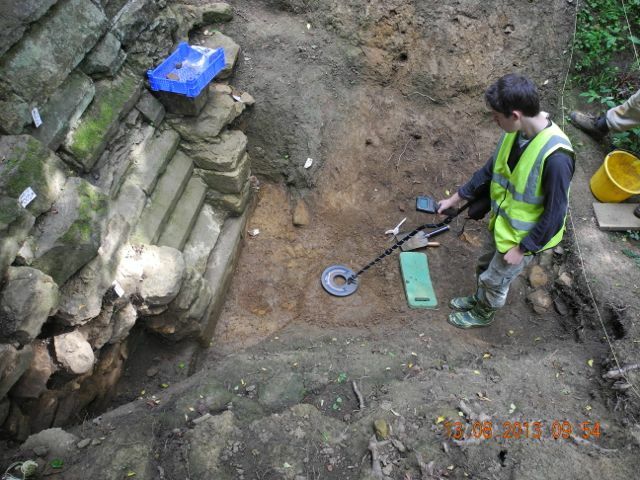 Peter was kind enough to confirm that some of the deposits we had described as natural were indeed undisturbed and he did this by using a large auger to bore down another 30 to 40 centimetres to check what was below. To finish what was a very busy month here is a word from someone else for a change. 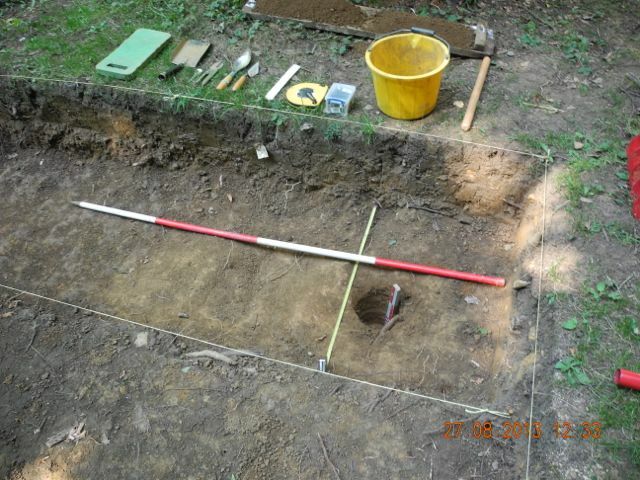 This is Peter Spackman's summing up of the last day of digging for August. Friday saw an influx of geology students from University of Southampton who thoroughly enjoyed a day of hard labour combined with intelligent conversation , interspersed with archaeological anecdotes from Viv (Viv, who kept the students entertained for the day also used her teaching skills to good effect and I am sure that all the students, under her guidance, became experts by the end of the day. 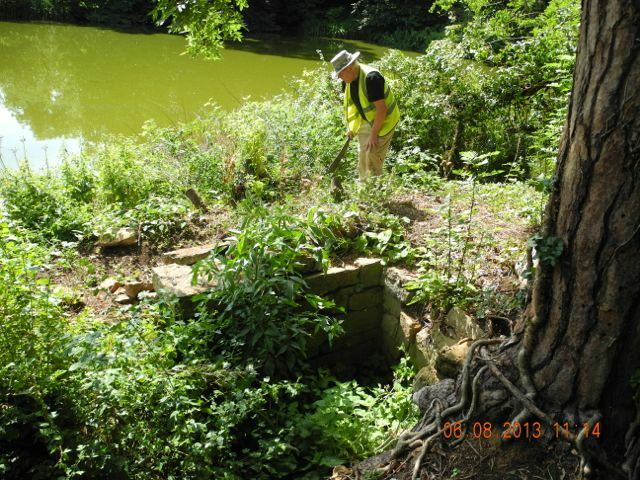 Work on the island kept two of the students occupied for some part of the day before an all out attack on the new area with expectations of uncovering one of the lower sluices and by the end of the day a large area of both rubble collapse and structural evidence were uncovered. 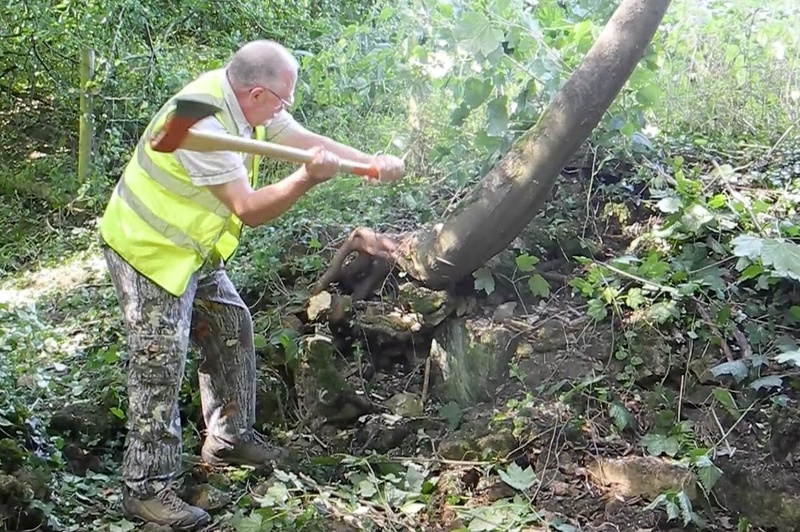 If you look at the photograph from earlier in the week just after the felling of the trees you can see how much progress has been made in such a short time. One of the joys of the Hanwell project are the spoil heaps, an often forgotten feature and rarely; depicted, written about or discussed but these deserve a mention. They [the spoil heaps] are turning into actual works of art and structural endeavours but at the same time have a functionality and a place, especially in an ancient private garden context; not too formal but a rough-coursed rustic element and I enjoyed spending most of my day assembling from an untidy pile of rubble a possible future artefact. Peter C. found time, away from globe trotting in retirement, to take in one of Stephen's garden tours and talk to some of the students and lunch in the Moon and Sixpence was enjoyed by four of the Feldon members. 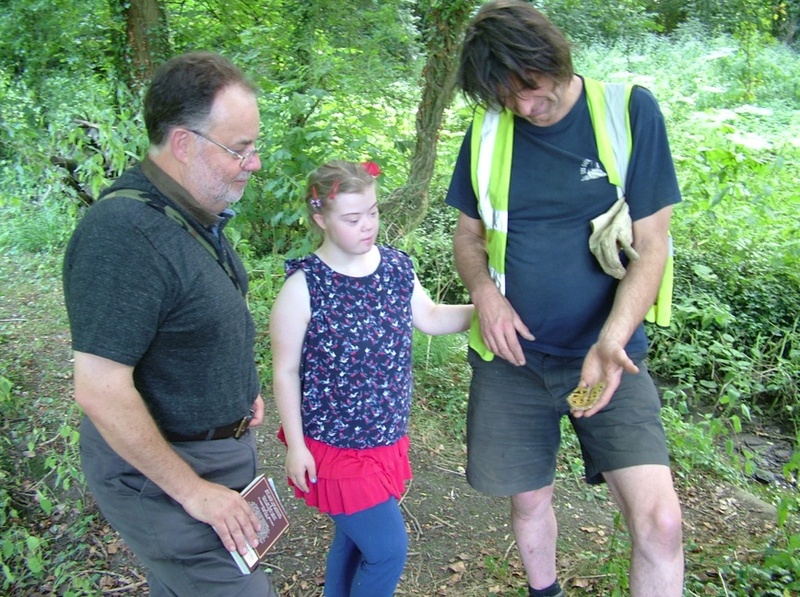 Peter E. accompanied by his enthusiastic daughter Rosie enjoyed the day and in the photo below we can see this reflected as Stephen shows one of the late-medieval pot sherds found during the day. Another clay pipe bowl emerged from upper layers of the lower sluice rubble; this bowl displays the letters RAOB (Royal Antediluvian Order of Buffalo's) over a set of buffalo horns which is datable to the latter part of the 19th. 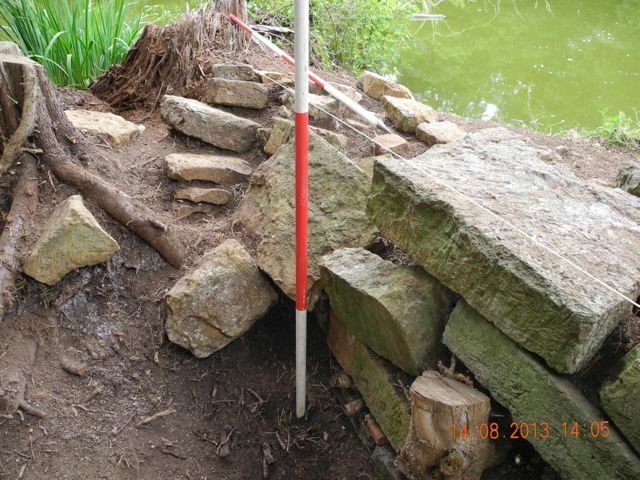 century matching the pipes from destruction layers of the upper excavated sluice area. The geology students were put to task when PE and myself presented a number of rocks (possible slingshot) from another project and with a certain expertise and determined bravado supplied a number of interesting details as to type and origin and an offer to further research the items was discussed. All in all another good day in the hidden gardens. 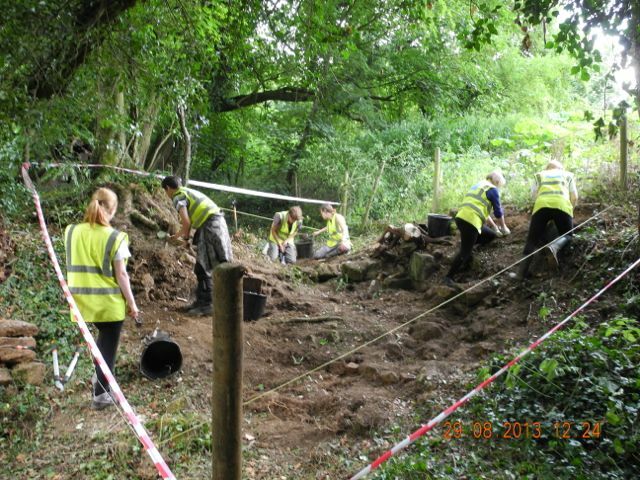 The last day's digging for the month and the finished result, a marvelous effort by all concerned.